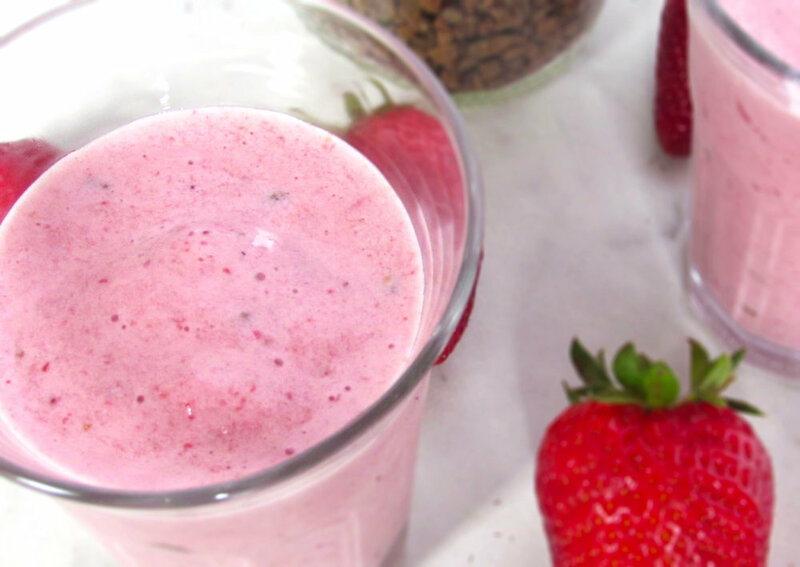 This smoothie uses strawberries that have been frozen to help thicken the drink but feel free to substitute other berries or use a combination of berries such as blueberries and raspberries. Buying pre-cut frozen fruit is a great budget-friendly way to always have on hand ingredients to throw in the blender for a healthy drink or snack. The “chocolate” part of this smoothie comes from cacao nibs. These are cacao beans that have been roasted, separated from their husks and then broken into pieces. They are high in antioxidants, magnesium and fiber. With a nutty flavor, they can be a little bitter so I use a lightly sweetened variety. They are also tasty simply sprinkled over yogurt or cereal. Combine all ingredients in a blender. Mix until smooth (will have flecks of cacao nibs throughout). Pour into one or two glasses and serve immediately.